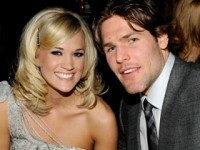 Carrie Underwood and Mike Fisher Wedding Confirmed! It’s official! Carrie Underwood and Mike Fisher are holding a well-secured wedding ceremony at the Ritz Carlton Reynolds Plantation in Greensboro, GA Saturday! In true superstar form, Carrie Underwood and team have managed to keep nearly every detail of her pending nuptials secret… until now! Sources say that Carrie Underwood and groom Mike Fisher are tying the knot in a private ceremony in Georgia at the Ritz Carlton Reynolds Plantation. Country Music News Blog participates in advertising programs that help fund the operation of this site. For more information please visit our privacy statement. This entry was posted in Carrie Underwood, Featured by Shauna "WhiskeyChick" Castorena. Bookmark the permalink.